ABU DHABI, 10th September, 2018 (WAM) -- His Highness Sheikh Mohamed bin Zayed Al Nahyan, Crown Prince of Abu Dhabi and Deputy Supreme Commander of the UAE Armed Forces, discussed, with His Majesty King Mohammed VI, King of Morocco, the strong ties between the UAE and Morocco and ways of promoting them while discussing regional and international issues of mutual concern. During the meeting, which was held today in Qasr Al Bahr and was attended by H.H. Lt. General Sheikh Saif bin Zayed Al Nahyan, Deputy Prime Minister and Minister of the Interior, H.H. Sheikh Mansour bin Zayed Al Nahyan, Deputy Prime Minister and Minister of Presidential Affairs, and H.H. Sheikh Abdullah bin Zayed Al Nahyan, Minister of Foreign Affairs and International Cooperation, His Highness Sheikh Mohamed bin Zayed welcomed the visit of His Majesty King Mohammed VI and highlighted the deep ties between their countries. Both sides discussed ways of developing and diversifying their political, economic, cultural and development cooperation, to achieve the aspirations of their countries and peoples. 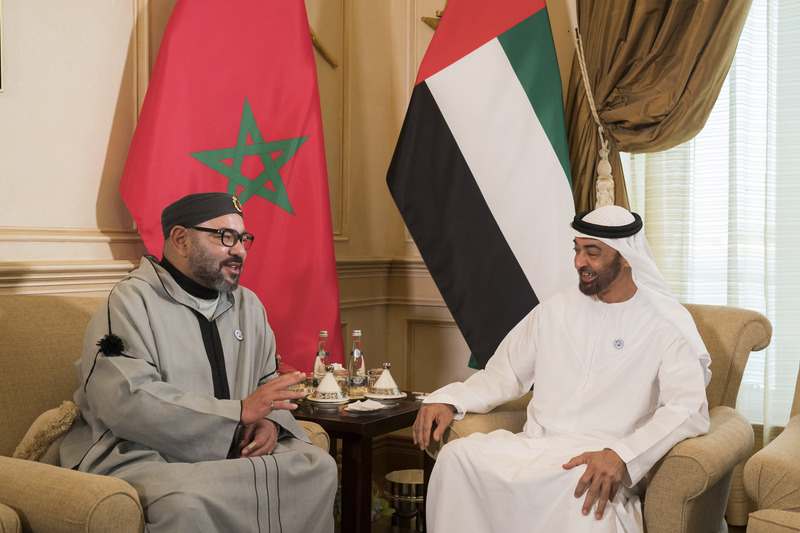 His Highness Sheikh Mohamed stressed that the UAE, under the leadership of President His Highness Sheikh Khalifa bin Zayed Al Nahyan, is keen to strengthen its ties with Morocco, to achieve their mutual interests and reinforce joint Arab joint, in light of the challenges faced by the region. 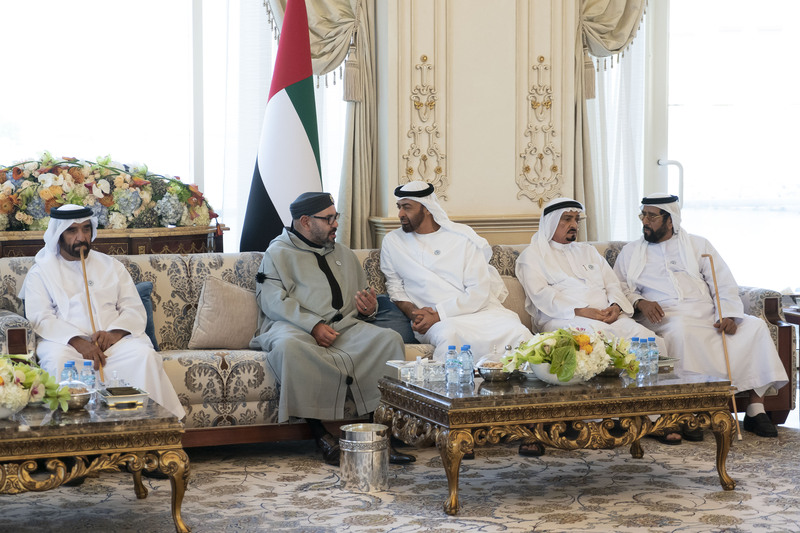 His Majesty King Mohammed expressed his happiness at visiting the UAE and highlighted the strong ties between the two countries while praising the UAE’s efforts to promote joint Arab action, under the leadership of His Highness Sheikh Khalifa. At the end of the meeting, both sides highlighted their keenness to strengthen their ties and promote cooperation, coordination and joint action, to serve the interests of Arab communities. They also stressed the importance of reinforcing joint Arab action to face the challenges and threats that threaten the region’s security and stability, as well as the need for continued coordination and consultation between the two countries on the latest regional developments. The meeting was attended by Nasser Boureita, Minister of Foreign Affairs and International Cooperation of Morocco, and Fouad Al Himma, Advisor to the King of Morocco. 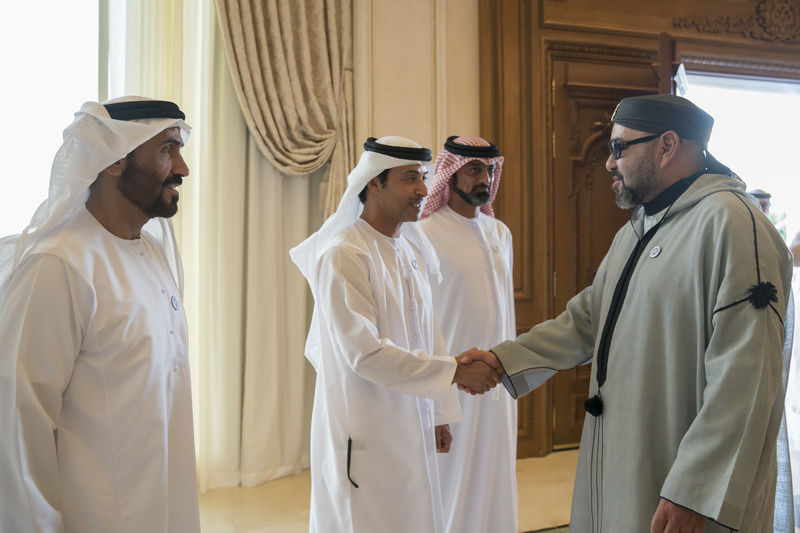 Upon his arrival at Qasr Al Bahr, King Mohammed VI was received by His Highness Sheikh Mohamed bin Zayed Al Nahyan. He was also received by H.H. Sheikh Humaid bin Rashid Al Nuaimi, Supreme Council Member and Ruler of Ajman; H.H. Sheikh Ammar bin Humaid Al Nuaimi, Crown Prince of Ajman; H.H. Sheikh Tahnoun bin Mohammed Al Nahyan, Abu Dhabi Ruler's Representative in Al Ain Region; H.H. Sheikh Saif bin Mohammed Al Nahyan; H.H. Sheikh Hazza bin Zayed Al Nahyan, Deputy Chairman of Abu Dhabi Executive Council; H.H. Sheikh Nahyan bin Zayed Al Nahyan, Chairman of the Board of Trustees of Zayed bin Sultan Al Nahyan Charitable and Humanitarian Foundation; H.H. Lt. General Sheikh Saif bin Zayed Al Nahyan, Deputy Prime Minister and Minister of the Interior; H.H. Sheikh Mansour bin Zayed Al Nahyan, Deputy Prime Minister and Minister of Presidential Affairs; H.H. Sheikh Hamed bin Zayed Al Nahyan, Chief of the Abu Dhabi Crown Prince's Court; H.H. Sheikh Abdullah bin Zayed Al Nahyan, Minister of Foreign Affairs and International Cooperation; H.H. Sheikh Khalid bin Zayed Al Nahyan Chairman of the Board of Zayed Higher Organisation for Humanitarian Care & Special Needs (ZHO) and H.H. Sheikh Khalid bin Mohamed bin Zayed Al Nahyan. Sheikh Mohamed welcomed King Mohammed VI. They engaged in cordial talks, reflecting the deep-rooted relations between the two brotherly countries.